KIEV, Ukraine -- Washington paid half a billion dollars for Ukraine to pass 5,000 nuclear weapons to Russia to be dismantled after brokering the deal. 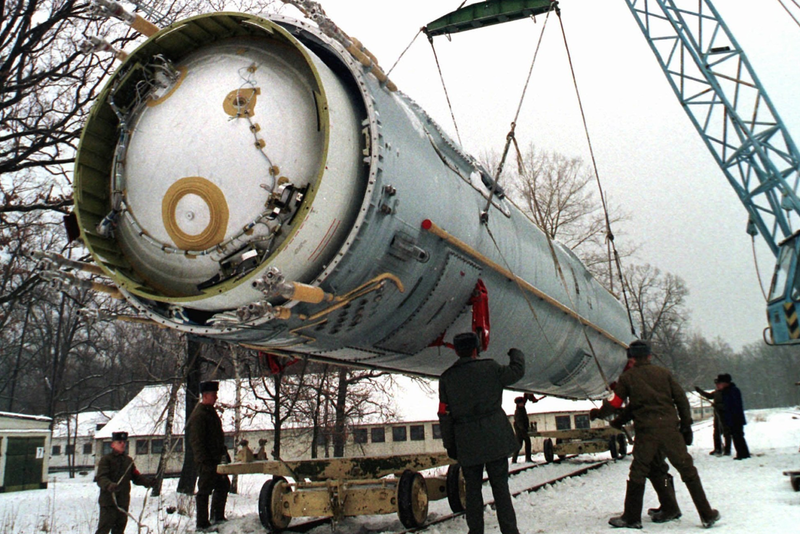 Soldiers prepare to destroy a ballistic SS-19 missile in the yard of the largest former Soviet military rocket base in Vakulenchuk, Ukraine. But the attack on the vessels and detention of their crews brought the relationship between the neighbors to a new low. Ukraine says the incident occurred in international waters. Ukraine insists Moscow is again blockading the sea, something Moscow denies. Russia says it merely needs to inspect all ships passing through as a security measure to protect a $3.6 billion bridge it's built across the Kerch Strait from its mainland to Crimea, which it annexed in 2014. "Ukraine gave up the third-largest nuclear arsenal" in the world, Ukrainian lawyer and human rights activist Stanislav Batryn told UkrLifeTV this week. "Today Russia violated the territorial integrity of Ukraine and is in fact starting a Third World War." The U.S. was extremely worried about the potential emergence of another nuclear power with ICBMs designed to target the U.S. and its allies. So Washington brokered the agreement and paid half a billion dollars for Ukraine to pass these weapons to Russia to be dismantled. In return, Russia, the U.S. and the U.K. agreed to "refrain from the threat or use of force" against Ukraine and to respect its "independence and sovereignty and the existing borders." Belarus and Kazakhstan also gave up their smaller stockpiles in exchange for the same promises. When Russia annexed Crimea in 2014, it was widely accepted that this agreement had been violated. After this week's clash on the Black Sea, Ukraine used the memorandum as a rallying cry. "We are appealing the entire pro-Ukrainian world coalition — we have to join our efforts," Ukrainian President Petro Poroshenko said Monday. "We are appealing to our partners in Budapest Memorandum that took on obligations to defend the sovereignty and territorial integrity." Russian President Vladimir Putin's explanation in 2014 was that the memorandum had been agreed with a previous Ukrainian government, so was no longer valid. Most observers dismissed this as ridiculous; if agreements expired with the governments that signed them, then countless important treaties throughout history would be now void. The problem is that the Budapest Memorandum is a political agreement rather than a legally binding treaty. It does not say countries have to take any particular action if it is violated, other than enter into talks. Some 200 U.S. troops are stationed at a base in western Ukraine, albeit hundreds of miles from Crimea or fighting in the east. And earlier this year the Trump administration sold Ukraine Javelin anti-tank guided missiles worth an estimated $47 million. "There's no way of making this a limited war like the Falklands," Watling added, referencing Britain's war with Argentina in 1982. "It would be World War III and the risk of nuclear escalation is unacceptable. We're not prepared to take that risk over Crimea."